I am a User Researcher with over 7 years of design and research experience in web and enterprise applications. "Wei is an awesome mentor! I signed up for the DesignLab largely for the mentorship and was not disappointed. She's very talented, knowledgeable and encouraging, and offered really thoughtful feedback on assignments. Though I've worked in research labs, UX and design are new to me. Most of the assignments involved things that were unfamiliar, so it definitely took me a longer time to do things like basic sketches. Wei was very helpful with answering questions about UX research and giving the right amount of feedback to help move me forward." "Wei was extremely helpful in giving advice on my projects and guiding me through the course. She is very knowledgeable about the topic and had a lot of great input!" "I honestly feel very lucky that I was partnered with Wei for this class. Navigating this new subject matter was really fun but also challenging and she made it easy to understand, help me begin to think in a new way, and assimilate her feedback into my projects. She also had a ton of actionable steps to move forward, which I wasn't expecting out of the class and were definitely as important to me as the coursework itself. I can't recommend her enough and hope that we stay in touch! Thank you!!" "Awesome sessions! Wei is really insightful and was really open to schedule changes, fast responding to exercises and really available to help. Couldn't be more happy." "Wei was a phenomenal mentor and made herself completely available to me. She was very flexible with her schedule and generous with her time and had great suggestions and advice on how I could apply new techniques to my projects." "Very helpful, friendly, and easy to talk to. She was always able to answer my questions and help me see things from a different perspective when I was struggling with an assignment." "Wei was a pleasure to have as a mentor. She provided thorough answers to any questions I had on the materials. Wei was so kind to send me additional information on things we discussed during our mentor sessions. A+!" "I think Wei is great. She's friendly and provides actionable, concise feedback. I hope to have her again for the interaction course that starts tomorrow (hint hint)." "Wei was a great mentor. She's smart, well-organized, and knowledgeable. She's also very approachable and easy to talk with, and consistently shared new insights throughout our calls. She provided frequent and thoughtful feedback throughout the sessions in addition to our schedule meetings which was helpful in getting through the material in a short period of time. I always felt that she was engaged and invested my projects. " 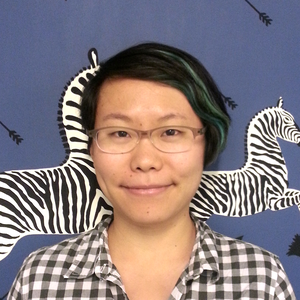 "A big part of what I enjoyed about my DesignLab experience was my mentor, Wei! She is very knowledgeable regarding the UX field and is so friendly and approachable. Wei had great resources for me to check out (articles, websites, books, newsletters) and it was really easy to talk to her for one-hour sessions. "